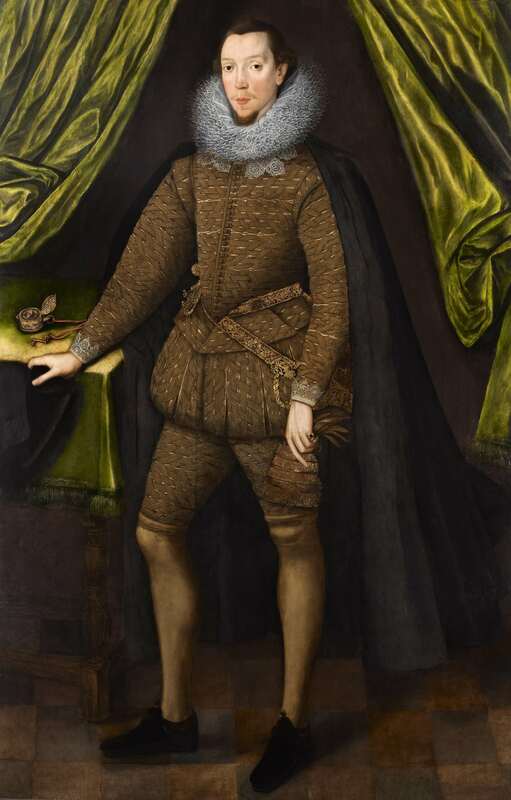 This is a rare surviving example of a late Elizabethan full-length portrait on oak panel, for by the end of the sixteenth century canvas had usurped wood as the support of choice for painters working on such a scale. The portrait can be dated on fashion to c.1595 and depicts the youthful William Fitzwilliam, the fifth in line of eldest sons all called William, dressed in the most extravagant and expensive of costumes. thence by descent at Shrubland Park, Suffolk. Christopher Hussey, ‘Shrubland Park, Suffolk’, Country Life, 26 November 1953, p.137, pl.10 (as hanging in the library). His great great grand-father, Sir William Fitzwilliam (d.1534), made his fortune in London as a merchant tailor, alder- man and sheriff of London. He was also treasurer and chamberlain to Cardinal Wolseley and, with the great wealth he amassed through trade, purchased vast acreage and many manors primarily in Northamptonshire and Essex. The fortunes of the family were to be further increased by Sir William Fitzwilliam (1526–1599), who served Elizabeth I as Lord Deputy and Lord Justice of Ireland. His father Sir William, who had married in 1569, spent thirty years at Elizabeth I’s court, but with the accession of James I retired to the country to manage his estates. His eldest son, our sitter, was probably born in the early 1570s not long after his father’s marriage. By 1593 he was studying in Cambridge at Emmanuel College, and in 1594 he was admitted to Gray’s Inn in London to study law. As befitted a wealthy courtier’s son, he also took lessons in singing and dancing, as well as attending a fencing school, all at his father’s expense. William married Katherine, daughter of William Hyde of South Dunworth, Berkshire in 1603. After his father’s death in 1618, he inherited the family estates and in 1620 was subsequently given the Irish peerage of 1st Baron Fitzwilliam of Lifford. However, the loss of court grants and sinecures after his father’s retirement resulted in a substantial reduction in the family income from the State. Since Lord Fitzwilliam now lived a similarly secluded life on his country estate, and without the benefit of any official office, he gradually drifted into ever increasing debt. By 1642 he owed £20,450 with much if his estate mortgaged or sold. It was only through the judicious marriage of his eldest son to a wealthy mercantile heiress that, after his death in 1644, the fortune of the Fitzwilliam estates eventually recovered. In our portrait, the young Fitzwilliam proudly displays his great wealth and status by the gilded finery he wears. The whole costume is an elaborate construction of interlocking gold braid which has been plaited and sewn onto an underlying layer of slashed silk, a wildly expensive and laborious technique. The long-sleeved doublet is further embellished with a row of gold buttons and complimented by cuffs made of the finest lace. His costume continues with the matching paned trunk hose and knee-length canions (or breeches), below which his stockings are fastened with tied silk sashes. The multi-layered lace ruff is worn over an additional lace collar and over his shoulders is draped a velvet-lined cloak. Whilst only the elaborately decorated hilts of his dagger and sword are visible, the artist has taken great care to capture in excellent detail the belt and sword hanger, which again is embroidered with an ornate gold design. The gold watch prominently placed on the table beside him is of comparable expense to his costume. A mechanical marvel of the time, this portable timepiece was small enough to be worn around the neck or attached to the costume, and in many ways was a precursor of the modern watch. This example was probably made in France or Germany specifically for the English market. Mary E. Finch, The Wealth of Five Northamptonshire Families 1540 –1640, 1956, p.124. T.P. Camerer Cuss, The Story of Watches, 1952. A similar drum-shaped German watch from c.1575 was formerly in the Atwood Collection and sold at Sotheby’s, New York, Fine Watches from the Atwood Collection, 11 December 1986, lot 7.